The waterproof Kindle Oasis comes with some nice perks and a new design that makes it easier to grip—but these premium features will cost you. With plenty of affordable e-readers on the market, the $249.99 Kindle Oasis raises some questions as to whether it actually commands such a high cost. After spending a week taking it everywhere—on our commutes, in our luggage, and around the town—we came away impressed. The price might be high, but a waterproof body, plenty of storage, customizable page display, and easy grip make it a luxury e-reader for a reader that isn’t afraid of splurging. Unlike most of the Amazon Kindle line, the Oasis has a thinner, boxy shape at 6.3 x 5.6 x 0.13-0.33 inches (HWD). It’s quirky, but it works. If the body was any thicker, it would feel clunky in our grip. In fact, it does grow a bit thicker halfway across the back of the device, where the e-reader slopes and thickens. This gives the user a nice, comfortable grip that can be used for both left- and right-handed consumers with a simple flip of the device. Its weight isn’t noticeable, as the 6.8 ounces is spread across the device. Strangely, it makes the Oasis feel lighter, and we held it for extended periods of time without any issue. One button on the bottom (or, for left-handed users, the top) is the power button, which turns the Oasis on and off. There are two buttons located on the front interface. These can be used in lieu of the touchscreen to turn pages while you’re reading a book, and makes it very easy to flip the page either with these buttons or with the touchscreen. Setting up the Oasis was very easy and quick, taking around ten minutes. It first filters through the nuts and bolts of the e-reader, such as the language selection and logging on to your Amazon account. If you don’t have an account, no worries—you also have the option to create one. Once you have an account, you also can link the Oasis to your Facebook, Twitter, and Goodreads. If for some reason you don’t want to link these accounts during the initial setup, you can always link them later by going into the Oasis’s settings. One of the features that sets the Oasis apart from its other competitors is the display. Because of its boxy shape, the screen is a massive seven inches. This sets it apart from its competitors because other Kindle models, such as the Paperwhite, only have a six-inch display, though both have 300 pixels per inch (ppi). Overall, we were pleased to see that the letters remained crisp, dark, and didn’t distort or discolor. While this doesn’t sound like much of a difference, for those who prefer larger print, this gives more room for words and causes less time swiping the touchscreen or tapping the buttons as you flip through the pages. We also liked the options for the page display. With 24 LED brightness levels, ten fonts, and five different boldness settings, the Oasis gives plenty of different settings to create a customizable page for easy reading. Tapping the top of the page, we went into the page display settings and also noticed that we could space out the lines to create a more compact reading, or to separate out the lines. We also checked the display under direct sunlight, in complete darkness, and at all angles. Under sunlight, there is a noticeable glare, which detracted from the reading quality. However, bolding the words and tilting the display away from the light alleviated this issue. In the darkness, the LED lights illuminate the words very well, making it easy to read at night without turning on a light. Overall, we were pleased to see that the letters remained crisp, dark, and didn’t distort or discolor. The Oasis also works great for general book use and magazines, though if you’re looking to read more colorful magazines, the grayscale can be off-putting. It’s similar with comic books and graphic novels. Though it will suit, the lack of color can be distracting from the overall picture. We don’t recommend this for reading comic books, though if necessary, it will do. Another perk about the Oasis is that it also offers parental controls during setup. The controls range from general settings, such as limiting the exposure to the Kindle Store and social media connections. This way, parents don’t have to worry about their little ones. One nice feature is that the Paperwhite includes a “Kindle FreeTime” app. Using FreeTime, parents can set reading goals, badges, and awards for reading books. Once parents create a profile and set reading goals, they can monitor progress and encourage reading. Finding and selecting books is pretty easy with the Kindle Store. The Kindle Store caters to your book preferences based on your library and will recommend books based on genre. When we tested out the Oasis, we stuck with science fiction, fantasy, and fiction. Once the store got a sense of books we liked, it recommended new and upcoming works as well as classic pieces. Our only issue was that some books can run $10 or more. Thankfully, the Kindle Store runs monthly and daily deals, giving readers the option to purchase books for only $2. Most of the classics can be found for a free if not greatly reduced price, such as War and Peace and A Christmas Carol. It’s a huge perk for those looking to reduce the heavy cost of books. During setup, you can sign up for a free trial of Audible. You’ll receive two free Audible books chosen by Amazon for the first month; after that, it’s $10 per month. The Oasis connects to Bluetooth audio speakers, and we tested it against our audio headphones, and home speakers. It recognized our Bluetooth headphones and home speakers with ease, and at great distances, too. We left the Oasis across the house and checked the portable headphones. They came in crisp, clear, and without any buffering. Keep in mind though that one of the significant drawbacks of Audible on this device is that you cannot listen and read along at the same time. The Oasis holds 8GB of data, one of which is used for the hardware of the device. Since 2GB of storage holds around 1,100 books, it’s great in that you can cart an electronic library in your bag or purse. Something to keep in mind, however, is that the Audible app greatly decreases the space on the Oasis. Most audiobooks run in the mid-100s in terms of MB (and, due to their size, take minutes compared to seconds for downloading the files), so an extended library of audiobooks will greatly diminish storage space. Since you can’t increase the space by adding a microSD card, this is something to keep in mind. One easy fix: the Oasis comes in both 8GB and 32GB space. The 32GB storage would be an easy fix for audiophiles. We wouldn’t recommend using the web browser if you’re in a hurry, as downloading a simple website took minutes, not seconds. Under the top bar, the Oasis has an Experimental Browser button. When we tapped it, it took us to Google, and so we tried going to our favorite websites. Unfortunately, the web browser is just that—a web browser. We wouldn’t recommend using this if you’re in a hurry, as downloading a simple website took minutes, not seconds. Even then, once it loaded, it was missing information such as pictures and links. Considering the price of the Oasis, we expected more, and were disappointed in this feature. Definitely stick to other internet-friendly devices if you’re looking to browse the web. The Oasis boasts that it’s waterproof, so we decided to test that theory. We ran two tests: the faucet test and the bathtub test. When we stuck it under the cold tap, the Oasis held up, not even registering it was under any kind of water. Similarly, when submerged in a bathtub, the Oasis didn’t register it was under water. We did make sure to charge it up beforehand, because you have to wait for it to completely dry before you can charge it. Otherwise, water might seep in through the USB port and damage the Oasis. At around $250, it’s a little hard to justify the purchase of the Oasis for anything besides the design. It has a bigger screen, which is a nice draw, but realistically, there are other, cheaper models that perform the same functions as the Oasis. However, the easy grip is a huge draw to this model, as well as the buttons. The buttons ensure that you have the option of using them or the touchscreen for an enjoyable e-reader experience. If you would prefer easy grip, then the Oasis is definitely the model you should consider. We checked the Oasis against the Paperwhite to see which is the better model for the consumer. Surprisingly, we didn’t find all that much of a difference besides in the designs themselves. 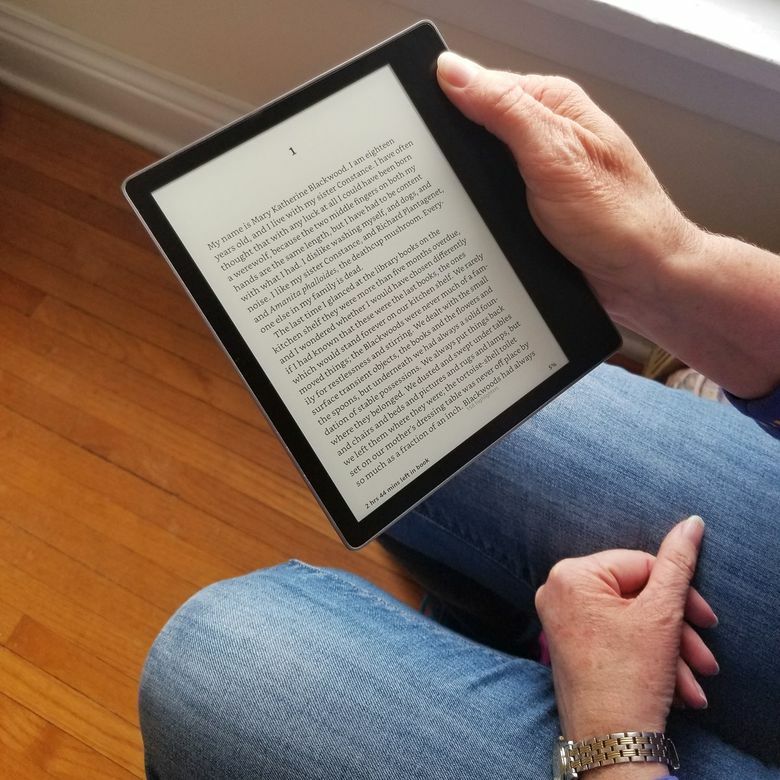 Both the Oasis and the Paperwhite come with the same software and hardware upgrades, such as the 8GB versus the 32GB storage, ample battery life, Audible compatibility, and the use of the Kindle Store. They both even came with a very slow web browser. The design is what sets them apart ultimately. While the Oasis boasts page-flipping buttons and a seven-inch screen, the Paperwhite only has the six-inch screen. For those who prefer a larger font, the Oasis definitely wins, as it fits more words to a page than the Paperwhite. The Oasis arguably has an easier grip with the built-in slope in its back. However, the Paperwhite is considerably cheaper, at about $100. If you’re looking for a better design, the Oasis would be better; if you would prefer not to spend as much on a Kindle, we suggest looking at the Paperwhite. Check out our guide to the best e-readers you can buy today. A great e-reader, but make sure the premium features are worth it to you. The Oasis is a high-end e-reader for someone who wants the best design and a larger screen. While the price tag certainly gives us pause, the premium features still make it a joy to use—just don't rely on it as an internet browser. Product Dimensions 6.3 x 5.6 x 0.3 in.